The search for India's best CFOs begins from another elite list - the BT500 listing of India's biggest corporations by market capitalisation. One exception is made here. For the best woman CFO category, we consider the broader listing of the BT1000 to get more names in because the number of women leading large companies' finances is abysmal. There are a total of 16 awards in 10 categories. The companies are split into two groups by size. Companies with net sales higher than Rs 2,000 crore in 2011/12 are called large companies, and the rest, mid-sized companies. For state-run companies, this threshold is Rs 10,000 crore. The quest to find the winners goes through three exhaustive phases. BT's knowledge partner, YES Bank, is instrumental in executing the survey. In phase one, the consolidated financials of the BT500 over the past three years are pulled out from the database Capitaline Plus. These are then analysed across multiple metrics such as market value to book value, market capitalisation, return on equity, working capital cycle, and many others. Companies are eliminated if the CFO has changed within three years, unless internally promoted. Even here, the CFO should have been with the company for more than three years. A peer set comparison is done for all sectors, and top performers are short-listed for phase two. In phase two, market research firm Ipsos India undertakes a perception survey of fund managers and brokers to assess factors such as corporate governance practices and stock performance. This year, we also surveyed chartered accountants, which was a suggestion from last year's jury. A separate panel assesses the Triple Bottom Line (or corporate social responsibility) category. 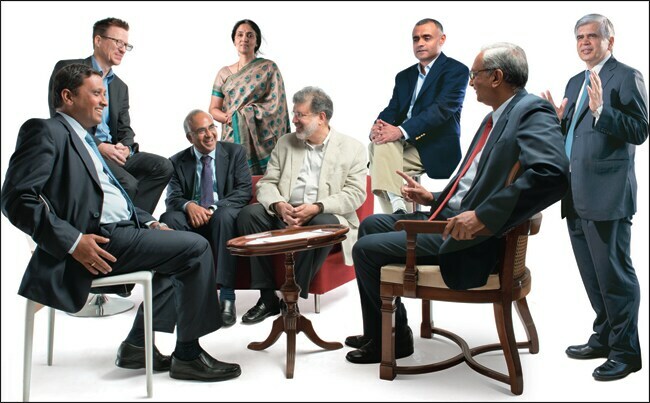 This year's jury meeting - phase three of the survey - was chaired by Chitra Ramkrishna, Managing Director and CEO of the National Stock Exchange. Other jury members were Richard Rekhy, CEO of KPMG India; Naresh Takkar, Managing Director and CEO of ICRA; former CFO of Tata Consultancy Services S. Mahalingam; and N.R. Bhusnurmath, Professor of Finance and Chairman of Accounting and Finance at Management Development Institute, Gurgaon. The meeting was moderated by Business Today Editor Chaitanya Kalbag, with Mick Gordon, CEO of Ipsos India, and Amit Kumar, Senior President and Country Head, Corporate and Institutional Banking, YES Bank, providing technical assistance. This year's jury also had several good suggestions to make. And again, dear reader, you will have to wait for next year's outcome to find out what they are. One thing is certain, though. The suggestions will make the survey stronger than ever.